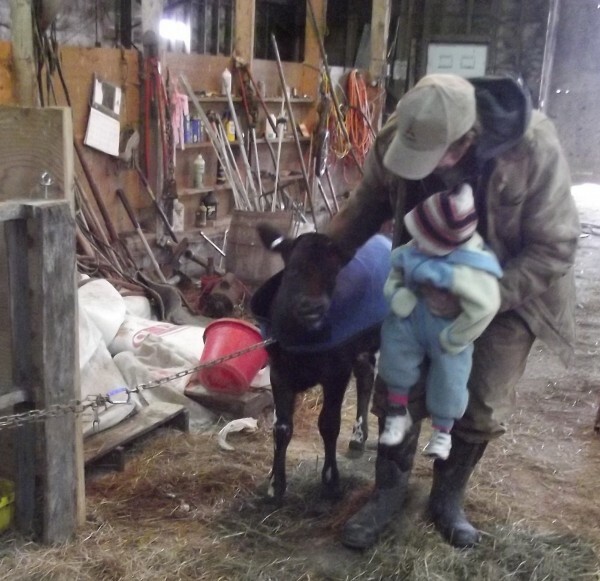 Aaron Bell, an eighth-generation farmer at Tide Mill Organic Farm in Washington County, introduces his not-quite-two-year-old daughter, Ruth, to "Bean," a Holstein/Jersey cross calf that will eventually join the farm's milking herd. Ruth is one of eight ninth-generation Bells now living on the farm. 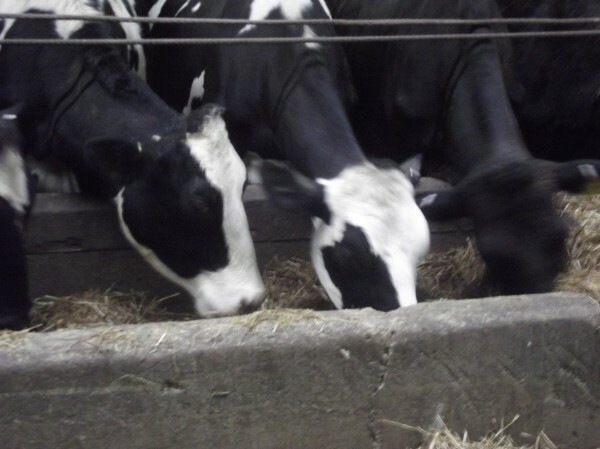 The dairy herd that produces milk for Tide Mill Organic Farm in Washington County includes both Holsteins and Holstein/Jersey cross breeds. EDMUNDS, Maine — Aaron Bell and Carly DelSignore of Tide Mill Organic Farm are working to increase opportunities for local farmers to produce more organic food. Bell and DelSignore, along with their four children, are one of six Bell families living on the Washington County Tide Mill farm, a 1,600-acre saltwater farm that has been in the Bell family since 1765. The farm is now populated by the sixth-, seventh- and eighth-generation Bells who are working it. Their collective dawn-to-dusk efforts produce meat and milk, all of which is certified organic and sold along a delivery route that extends from Brunswick to Calais. The sixth and seventh generations of Tide Mill farmers had ceased milking operations in 1977, when Aaron Bell, the eldest of his generation, was still a child. In 2005, when the Hood milk marketer was looking for more supply for its Stony Field brand, Bell and DelSignore rejuvenated the milking infrastructure with a new dairy herd and signed a two-year contract with Hood. When the couple’s contract with Hood ended, they started supplying to Moo Milk. Moo Milk is now the farm’s biggest customer. The farm’s daily milk production comes from a herd of nearly 50 milking cows, with about 70 percent of the raw milk going to Moo Milk. While the farm off Route 1 operates a seasonal farm store two days a week, most of what’s produced is sold on a wholesale basis. The farm also sells to some 15 wholesale accounts; buying clubs in Calais, Machias and Eastport; and at farmers’ markets. The couple is now trying to expand its delivery route farther south. They also are working to increase organic food production in Washington County by trying to get more milk producers for Moo Milk and encouraging other farmers to grow organic vegetables and raise organic chickens and cattle. growers in the past who have done some contract growing. We’re trying to find a few cooperators that we can contract with to grow organic products, and we’ve had a lot of response. Bell and DelSignore also are working to increase awareness and appreciation of locally grown food. One of the ways the couple is working to increase the value of the food they produce is by working with Rachel Bell and Ethan Bien, two friends who have been running Tide Mill Creamery since 2010. Rachel Bell, who is Aaron’s cousin, and Bien buy milk from Aaron and DelSignore and increase its value by transforming it into products such as whole milk yogurt, lowfat yogurt, Greek yogurt and cheese. Rachel Bell and Bien make a point of incubating their products in glass jars, rather than plastic containers, as they want to avoid contamination by any chemicals in plastic. Glass jars, they feel, are more environmentally friendly, as customers will bring back jars that can be reused indefinitely. The whey byproduct of milk production provides feed for the farm’s pigs, ensuring that there is no waste from the milking operation. Rachel Bell and Bien also are thinking of producing a new, whey-based energy drink called Whey-to-Go, which they hope to showcase at this summer’s Lubec Marathon. For information on Tide Mill Organic Farm, go to www.tidemillorganicfarm.com. For more on Tide Mill Creamery, visit tidemillcreamery.wordpress.com/.